I love Umi Sake. I have gone so many times, it is outrageous to me that I've never reviewed this place! I go here when I'm in the mood for some specialty sushi rolls or when I'm in the mood for some Yaki Bop, or when I'm generally just in the mood for some good Asian food. I've gone a number of times with a big group, and the service is just as flawless as when I go with just another person. Yaki Bop with Beef ($11.95) - Korean-style rice dish served in a hot bowl with beef, green beans, bean sprouts, other veggies and an egg on top! If you've never tried this dish, I urge you to give this a go! First of all, this is a TON of food, so be prepared for leftovers! 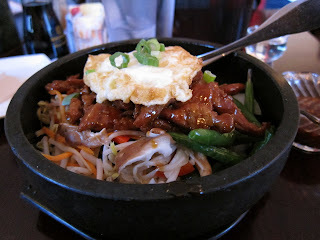 The beef is in a slightly sweet brown sauce, the vegetables are crunchy, and the egg is the perfect topping. Great dish! Yuzu Seared Tuna Roll ($12.50) - Seared tuna on the inside of the roll, topped with avocado, white tuna, crispy onions and yuzu sauce. This was incredible - and what a beautiful presentation! Everything tasted fresh and I loved that the crispy onions were a legitimate part of the meal instead of a garnish. I really really enjoyed this. To be honest though, I am always impressed, regardless of whether I order a specialty roll like this one or a California Roll! 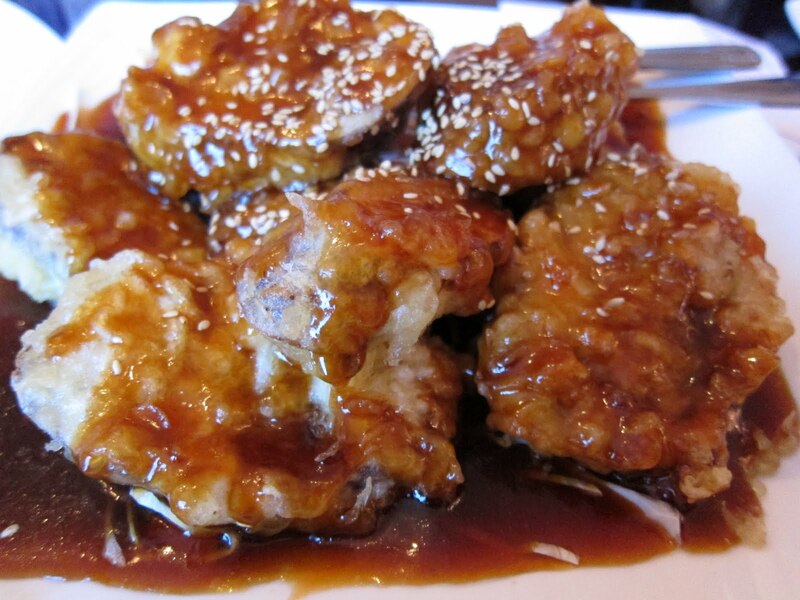 Crispy Eggplant Stuffed with Shrimp ($11.95) - Served in a honey glaze sauce. This is probably my least favorite dish I've had at Umi Sake, but by no means does that mean bad. 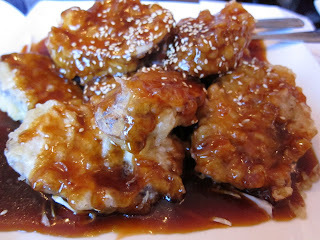 I loved the crispy eggplant/shrimp itself, I just felt that there was WAY too much sauce, so the crispiness turned into sogginess. This would definitely appeal to people who love to order Crispy Honey Chicken or Crispy Honey Shrimp at Asian restaurants. I would just ask for them to bring the sauce on the side! p.s. I've heard their Brunch is fantastic! I love Umi Sake, too. Their rolls are very creative, yet not crazily priced. Haven't tried much in the way of non-sushi items there though. I seriously love everything there - YUM!